Linda first started modelling in clay at a Battersea Art School evening class in the 1980's when she got bored waiting for her turn on the wheel. Moving to Oxfordshire in the 1990's, it wasn't until her four children had settled into full-time education that Linda again took up working with clay, under the expert tutelage of sculptor, Juliet Dyer. Deciding to concentrate on the human form and therefore wanting to learn about anatomy, Linda attended Life classes at Sunningwell School of Art, Oxford College of Further Education, and the Oxfordshire studio of Rosamund de Tracy Kelly. 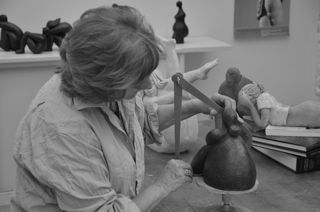 For thirteen years, Linda was a member of the Bicester Sculpture Group, based in the late George Muller's studio. Here, she learnt how to cast her own pieces in bronze resin, whilst experimenting with fibrocem, plaster and cement fondu. A welding class at Banbury College of Art introduced Linda to the technique of armature building. Summer 2008 saw a big leap forward, with her first piece being foundry cast in bronze and the opening of her own studio in the Cotswolds. Linda's sculpture is continually evolving and animals and larger, outdoor pieces now also make up her work. Linda was elected a Member of the Oxford Art Society in 2001 and became a founder member of the Oxfordshire Sculpture Society in 2002. Her work has been illustrated in magazines and she has a chapter portraying her sculpture in the book, 'English Country Houses', (Mitchell Beazley, 2004). Her first London exhibition took place in 2018 at The Royal Arcade Gallery, Pall Mall.